VATICAN CITY—Claiming the vestments represent a vital step in ameliorating the church’s centuries-long history of addressing sexual abuse with subsequent cover-ups, the Catholic Church introduced a line of wrought iron molestation-proof altar boy uniforms Monday. “With these new impenetrable steel robes, Catholic altar boys can now serve the Lord and assist with Mass without the shame or fear of tempting otherwise pious clergymen,” a joint statement by senior Vatican officials read in part, explaining that the full-coverage metal loin-girdings are available to fit all sizes and ranges of youth’s suppleness and are guaranteed to spurn the fingers of any priest who attempts to violate its boundaries. “The ceremonial six-inch-thick wrought iron vestments also boast a built-in alarm system; if the wearer is touched anywhere below the navel, a loud recording warns the offender to stay back in both the local dialect and High Latin. 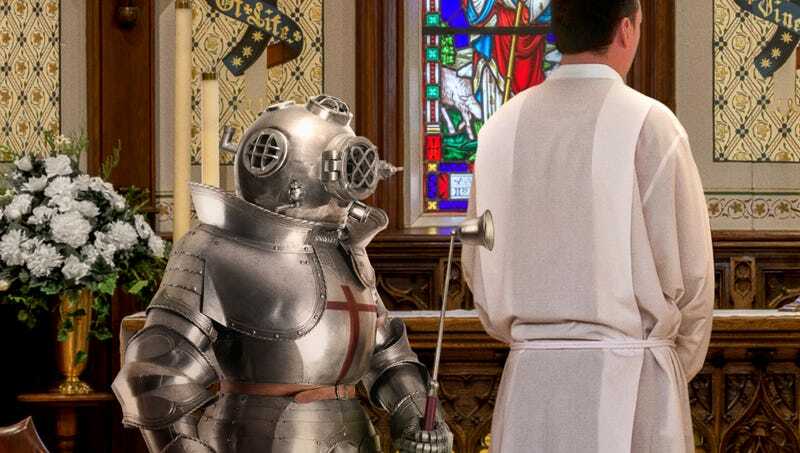 It is greatly hoped that with the implementation of these suits, we can finally spread the word of God in peace without the constant inconvenience and expense of shuffling priests from parish to parish after they’ve succumbed to the not-inconsiderable temptations of the younger members of our church.” Vatican officials clarified that neither they nor the manufacturer were responsible for any priests who somehow figure out a way to get inside the suit with an altar boy.